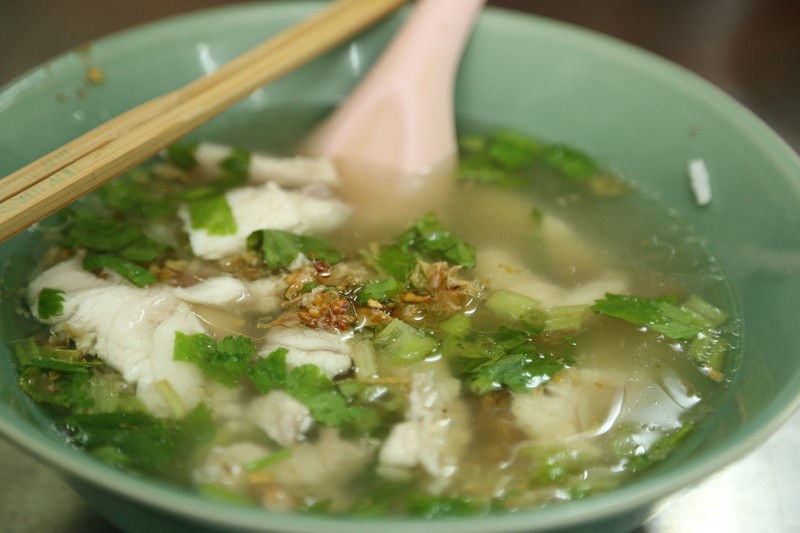 Khao tom pla is rice soup with fish. The first years I visited Thailand I couldn’t think of something more boring. It Sounded boring and it really didn’t trigger anything in me. Then I tasted it for the first time, some years ago, and now I visit every khao tom vendor I pass by in my project of eating my way through Bangkok. For me, this really is one the best soft-boiled rice with fish there is in the city of angels. 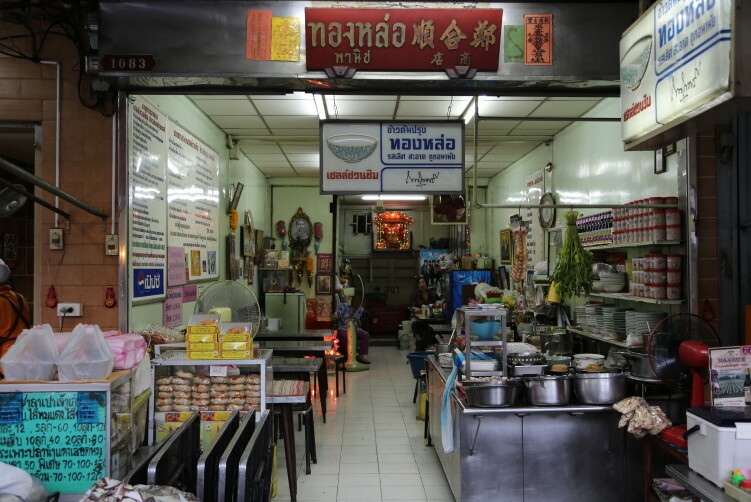 Priority one at Khao Tom Prung is to get there sooner rather than later. They only prepare one grouper per day and that sells out rather quickly. But don’t panic, the alternative is the mixed bowl. At least you’ll get a taste of the delicious grouper. If the mixed bowl is out, pork stomach is an alternative. It’s thoroughly cleaned and cooked to order. Tender and sweet it is as well. Still, most westerns would shy away from intestines. If you have the guts, I don’t think you’ll regret it. Some locals eat it with sweetened pork. It’s a nice experience. Personally, I eat intestines once and while, but not every time due to the cholesterol in intestines. But back to the khao tom pla. It’s all about cooking skills and fresh ingredients. In other words, no secrets here. It has a diversity of toppings. It’s B100 a bowl. Not bad for really home made food made with love. And yes, they have the Shell Shuan Shim award. 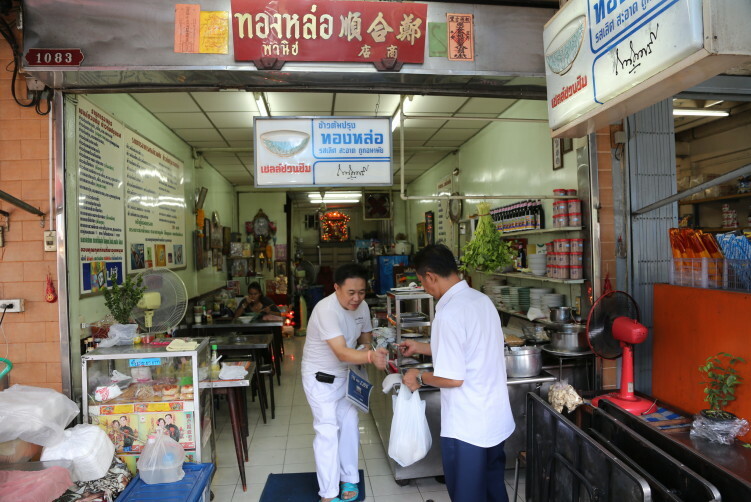 Read My article The Michelin Stars of Street Side Bangkok to find out about it. If you’re a real fish fan, there are also fish eggs and fish maw (swim bladder) on the menu, also selling out fast so be there before 7 pm or call ahead to reserve. Fish maw is a rather rare thing these days. It doesn’t taste fishy as you might think. It soaks up the flavors from other ingredients and male bladders are considered more tasty than those from female fish. When fried it’s very puffy with a fantastic spongy texture. Fake fish maw is actually quite common due to limited supply. One method is to use pigs skin together with chemical plastic to imitate fish maw. 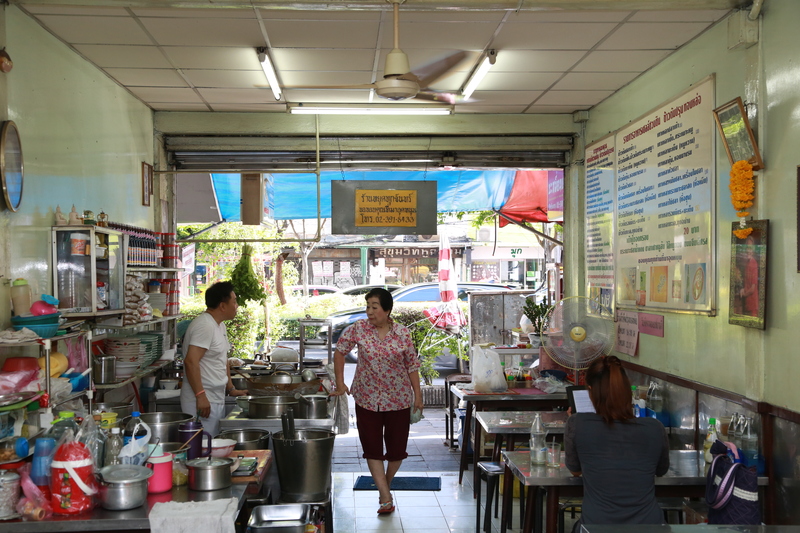 Anyway, at Khao Tom Prung, you get the real thing. Another great spot for fish maw is by the way Ah Oh Bangrak, close to Asiatique, if you’re in for some shopping. 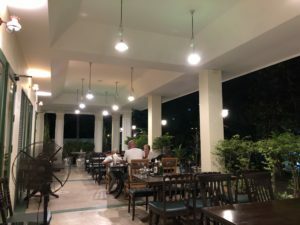 click here Food: Khao tom pla, fish maw and some more. Price: Rice soup with fish is 100 Bath and worth evert single Bath. How to get there: Take the BTS to Thong Lo (Thong Lor). Take Exit 3 and cross Soi 55 (Soi Thong Lo). 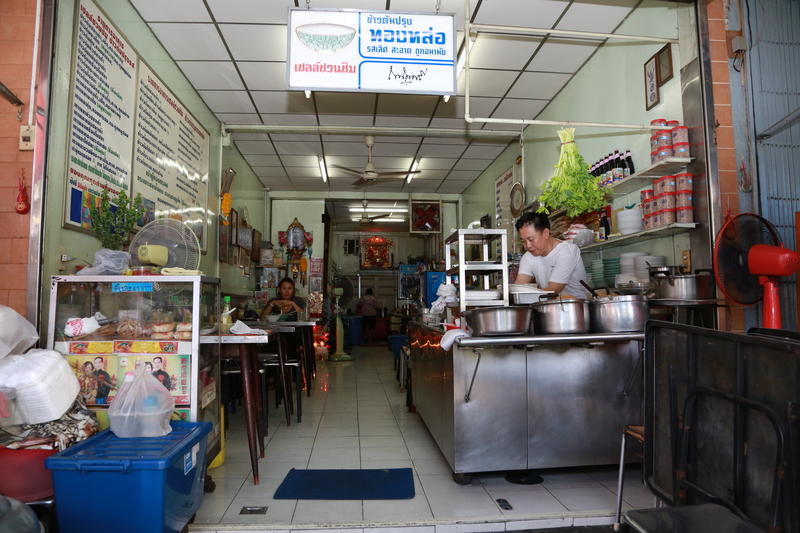 It’s on the corner to Sukhumvit Soi 55. Khao tom pla is rice soup with fish, and this is really one the best soft-boiled rice with fish there is in the city of angels. See full review at StreetsideBangkok.